Loomstate !Act Natural! Blog: Tulips... made from organic cotton? Tulips... made from organic cotton? The Barneys display of our colorful Loomstate BLANK Tees has the soft and bright 100% organic cotton tees in the shapes of tulips just in time for the 40th Anniversary of Earth Day. 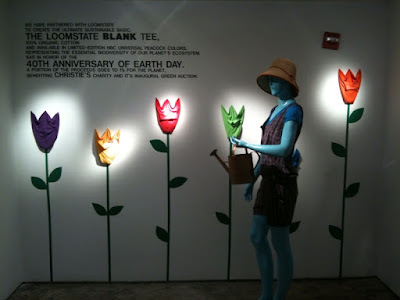 The mannequin, dressed in a bright blue Loomstate BLANK tee and our La Paloma jumper may be the most stylish gardener we know! BLANKS are available now at Barneys and Loomstate!